The Southeast Louisiana Clean Fuel Partnership is a coalition of vehicle fleet managers and operators; alternative fuel, vehicle and technology providers; local, state and federal government agencies; and other organizations interested in promoting policies and practices that diversify our transportation fuel options, improve our environment and reduce fleets’ operational costs. As part of a network of almost 100 US Department of Energy- designated Clean Cities Coalitions nationwide, the Clean Fuel Partnership provides education, technical assistance, funding information and other services to assist vehicle fleet managers and personnel incorporate cleaner transportation options into their operations. Interested in receiving Clean Fuel Partnership emails about funding opportunities and upcoming events? Become a Member! 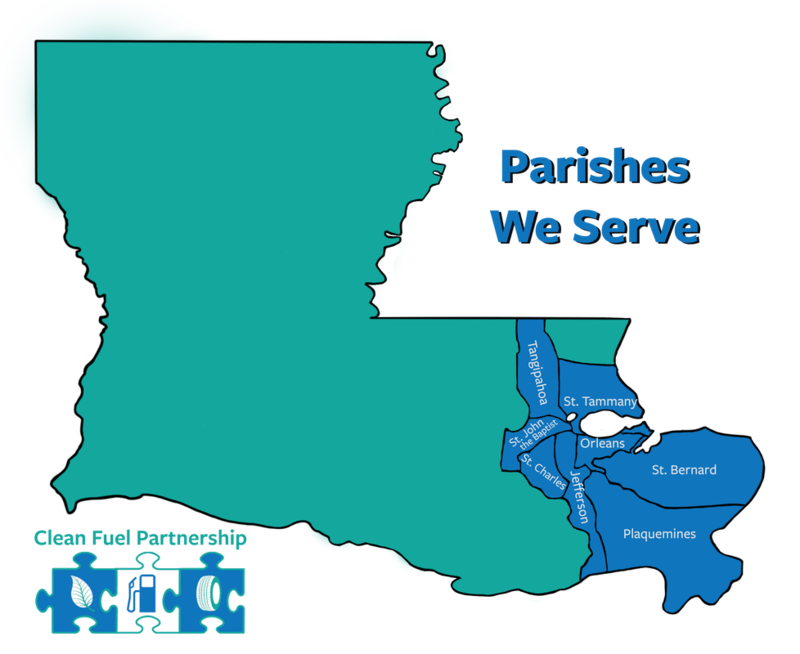 The Southeast Louisiana Clean Fuel Partnership is housed at the Regional Planning Commission which serves eight parishes (counties) in southeast Louisiana: Jefferson, Orleans (includes the City of New Orleans), Plaquemines, St. Bernard, St. Charles, St. John the Baptist, St. Tammany, and Tangipahoa. The Regional Planning Commission is a board of local elected officials and citizen members, appointed to represent their jurisdictions on regional issues. This board is supported by a staff of 23 professionals with broad experience in a variety of areas including urban and regional planning, community development, economics, engineering, government, history, law, landscape architecture, political science, sustainable development, transportation, geography and other disciplines. The Southeast Louisiana Clean Fuel Partnership is supported by the Louisiana Dept. of Natural Resources’ (LDNR’s) Technology Assessment Division, Louisiana’s State Energy Office. The mission of LDNR is to ensure and promote sustainable and responsible use of the natural resources of our state so that they are available for the enjoyment and benefit of our citizens now and in the future, and to preserve and enhance the nonrenewable natural resources of the state, consisting of land, water, oil, gas and other minerals through conservation, regulation, management and development to ensure that the state of Louisiana realizes appropriate economic benefit from its asset base. Within LDNR, the State Energy Office promotes the efficient use and management of energy in the state. It helps maximize Louisiana’s energy potential by exploring all energy sources and by reducing current energy consumption through education, energy-use studies, and demonstrations of energy-efficient technologies. LDNR’s State Energy Office also serves as the primary manager of energy efficiency and renewable energy programs funded by the U.S. Department of Energy. For additional information on cleaner transportation options, please visit the U.S. Department of Energy's Alternative Fuels Data Center and Clean Cities Coalition websites.